It has ever been within human nature to create symbols and parables that allow us to access the incomprehensible. Time, in all of its untouchable vastness has taken myriad forms and representations: from the Titan Kronos, son of Heaven and Earth, to our own peculiar obsession the humble wristwatch. Whether we embrace the flow of time or attempt to defy it, are enraptured by it or feel that “time is the fire in which we burn,” the “persistence of time” is something that none of us can ignore: The turning of the seasons, of the days and years as they roll by. The rise and fall of the Sun, the Cheshire-cat smile of the Moon, a melody which we find reflected in the endless circling of watch hands, the intermeshed harmony of gears and wheels — an analogue for the celestial clockwork. 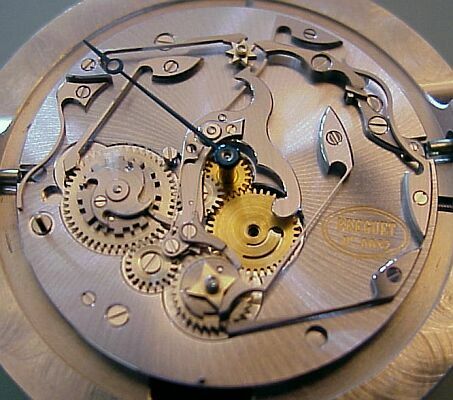 The idea of the circular in motion and shape is one that permeates horology to the earliest origins of the science. As Jean-Claude Biver of Blancpain once said, “For centuries, a watch was round, because the movement was round, and every aspect of the time is round : planets, the movement of the planets, the universe itself. The round shape is out of time: it is the time itself” (Friedberg). This circularity can be broken or expressed on a wristwatch in simple ways: The guichet (“window”) for example indicates a point or a discrete measured piece of time, while the dial and subdial indicate the continuity, the infinite. The standard 12-hour dial repeats only a tiny slice of time — merely 2/3 of the average waking day, and the date window now so common is a disembodied easy reference for the modern office worker. Most watches therefore serve to reduce time into easy-to-handle pieces, but in doing so separates us from the full sense of time, of the movement of life. While there is a certain harmonia mundi expressed by world-time and universal-time watches, 24-hour dials, and “night & day” indicators, the real living rhythm of time created in the harmony of the celestial spheres — a grand opus born of the interplay of Earth, Moon, and Sun — is the province of the “astronomic” calendrier complications, from the simple shifting phases of the lunar disc, to the complexities of the Julian calendar in perpetuam. The history of astronomic clocks and watches is a long and varied tale, from the early water-driven mechanical clocks of China like Su Sung’s Cosmic Engine (1088 AD), to the weight-driven astronomic clocks of early Renaissance Europe, and the first astronomic pocket watches of the late Renaissance. The perpetual calendar as we have come to know it is one more part of the grand legacy of Abraham-Louis Breguet, both in pocket watches and in carriage clocks — beginning in 1795. These calendar complications have continued to flourish over the centuries, and we find a wide diversity available today. Of course a wide breadth of multifarious forms and styles naturally compounds the difficulty of comprehension and appreciation for the newcomer, as does the prevalence of press and industry usage of French terminology in an international market where ironically English is the lingua franca. Thus I have set out here to overview the basic typology of this important branch of complicated wristwatches, with a few archetypal examples in conclusion. For definitive explanation of the ways we demarcate the passage of time, including the evolution of the western calendar, please see Edward Hahn’s three-part series On the Units of Time. Herein I will assume that the basic concepts are already understood. Quantime (lit. “day of the month”) — in industry usage this appears to encompass two of the simpler calendar complications: with day and date indications; or day, date, and month. The latter are referred to as “complete calendars” in English usage, or colloquially as “triple dates.” Quantime watches need to be manually advanced five times per year — at the end of every month shorter than 31 days: February, April, June, September, and November. Quantime Simple — A watch with a date guichet or pointer as its only calendrier indication; the most common form. Quantime Annuel (annual calendar) — The newest of the calendar complications, an annual calendar is a quantime watch (day, date, and month; or date and month) that automatically advances the calendar display at the end of short months with 30 days: April, June, September, and November. Annual calendars must be manually advanced once per year on the first day of March: From February 30th to March 1st on leap years, and from February 29th to March 1st on common years. Quantime Perptuel (perpetual calendar) — These typically display day, date, and month, or day, date, month, and year. Year indications vary from the simple four year “leap” cycle, to two and four-digit numerical displays. Ideally the quantieme perpetuel automatically advances on all months shorter than 31 days, including February both in standard and leap years (annes bissextiles). But as Julian calendars however, all periodically require a manual adjustment by a watchmaker or user in order to remain in synch with the Gregorian calendar in usage today. Unfortunately the technology of mechanical perpetual calendar watches has not yet caught up to refinements in the western calendar which predate their invention. Equation du Temps (equation of time) — The Equation of Time calculates the difference between actual solar time and local mean time, a difference brought about by the Earth’s elliptical orbit around the Sun and well as its axial tilt relative to the orbital plane. An equation of time wristwatch is a perpetual calendar which displays this continuously changing deviation of true solar time from mean time throughout the tropical year. Phase de Lune (moonphase) — Displays the eight phases of the natural 29.53059 day lunar cycle, sometimes indicating the “age of the moon” numerically as well. In its simplest and least accurate form, the moonphase display is accomplished with a 59-tooth moonphase disc with two moons. 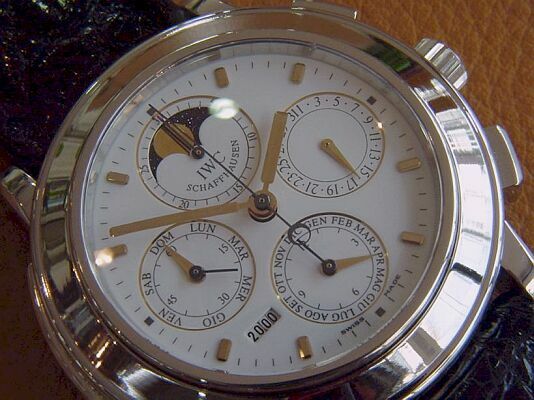 High accuracy moonphases on a handful of high-grade watches use a higher-count of finer teeth and/or additional gearing to reduce the error rate down to 1 day in 122 years (as in the IWC and the AP below). The special extra-high accuracy lunation display of the Lange 1815 Moonphase (shown at top) achieves a reported error rate of 1 day in 1058 years, using a three-moon disc and presumably even more complex gearing. 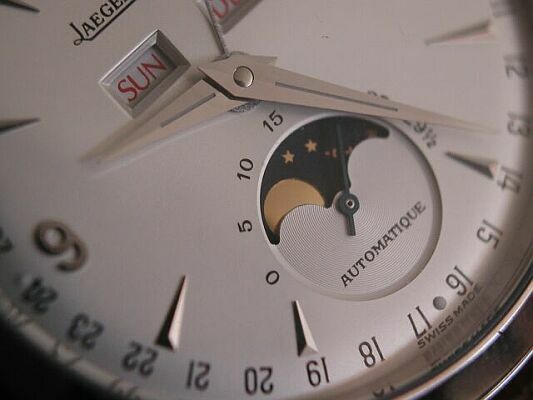 A few modern moonphase watches use a pointer subdial like the early astronomic watches of the late Renaissance, rather than the almost universal guichet of today. While the “Month” was once based upon the lunar cycle, with approximately 12.368 “moons” in a year, the connection has long been broken — one cannot tell the age of the moon from the date of the month. A month is now merely a traditional and convenient division of the 365.24219 days in a tropical year. Though the lunar cycle plays no direct role in the Julian and Gregorian calendars, it often completes the vision of the dance of Earth, Moon, and Sun on a calendar wristwatch. A complication for the rest of us, the basic quantime wristwatch has a timeless elegance that has been long supported by its relative accessibility — the most complete calendar complication available to almost everyone, and therefore in some ways the most significant. While like a quantieme simple central emphasis is placed upon the date indicator, it adds the richer context of the day, month, and often the phase of the Moon. The heyday of these quantieme and quantieme phase de lune watches lies in the decades after WW2, when automatic-winding began to flourish in the watchmaking industry, which itself may be responsible for much of the ongoing success of calendar complications today. Jaeger-LeCoultre vintage quantiemes, but at least for me it seemed that something was missing. In recent years this “something” was touched upon by the Master Moon with black dial, and finally fulfilled by the new Master Moon with silvered dial as shown above. In an attempt to bridge the large gap between the basic quantieme and the full quantieme perpetuel was born the quantieme annuel. Still rare today, they are yet only produced by a few manufactures, one of which has found it to be quite rewarding in terms of exposure and sales. Annual calendars tend to reflect the simpler and more “practical” design sensibilities of the simpler quantiemes, but with an added convenience that approaches that of the fully perpetual. moonphase, and an integrated bracelet, ref. 5036/1, and its limited production variant ref. 5056P as shown above. 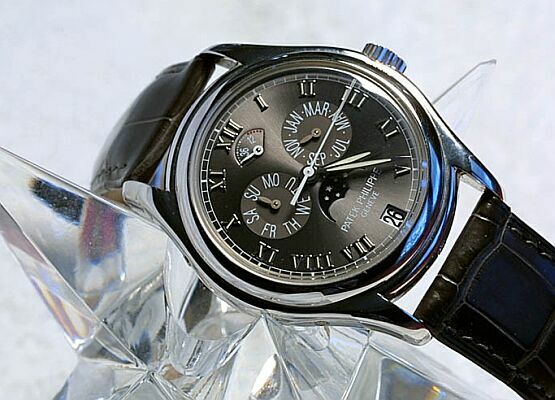 In a platinum case with leather strap it became the best of both the 5035 and the 5036/1. The diamond it bears hidden between its lugs hallmarks the white metal as platinum — the first such use of a diamond by Patek Philippe. While the 5035 is probably considered the best “value” available within the vast scope of quantieme watches today and has no doubt convinced a large number of potential Calatrava buyers to “step up” to a complication, its younger and rarer sibling is in my opinion the best yet achieved in this new world of annual calendar wristwatches. The idea of forever to the mortal being is one both magnificent and terrifying. For some it leads us to become as Ozymandius seeking immortality in works or deeds or fame, for others to retreat into a collapse of powerless futility. The perpetual calendar as a symbol of time and eternity bears this dichotomy, and perhaps reminds us with every glance, a vivid Carpe…! Jaeger-LeCoultre has used this rather than produce their own in-house for their Master Control collection. A further development of the quantieme perpetuel, the equation du temps brings the presence of the Sun and its true solar time to a world now controlled by atomic “mean time.” Of the perpetual calendars it alone restores something lost in a world run by artificial timekeeping — the seasonal shift of light and darkness. For wristwatches this cycle has only been captured twice: First attempted by the house of Breguet in 1992, and recently in a more technically correct and complete form by Audemars Piguet’s Jules Audemars Equation du Temps (shown above). 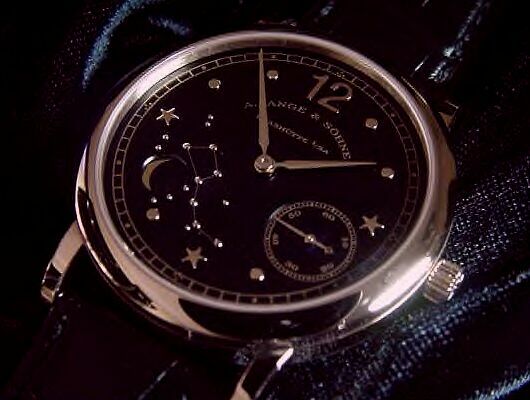 Based upon the design of an Audemars Piguet pocket watch from 1925, this Wristwatch of the Sun not only shows the deviation between solar and mean time, but the correct times of sunrise and sunset as well — both precisely tuned for the observer’s location on the Earth (factory preset). Amazingly, the complexities of the equation of time is translated into the curves of a single “potato” cam which controls the movement of the Sun hand. In platinum with a dial of symbolic solar radiance, this limited edition of 20 reflects in a unique and starkly beautiful way our personal daily experience of the cycles of light and darkness — a central and very human hymn in the harmonic cosmogony. Friedberg, Michael. TimeZone Interview with Jean-Claude Biver 1999. Tolkien, J. R. R. The Hobbit 23rd ed. New York: Ballantine Books, 1933, 1938, and 1966.